So close to the beach you can smell the salt air! Ruby's Luxe is 45m from Bondi Beach. Located amongst the local shops, bars & restaurants with five bedrooms, three bathrooms, a deluxe kitchen, open plan living/dining, hotel quality bedrooms, contemporary bathrooms with wet room & spacious living areas. Located on the footsteps of world famous Bondi Beach, our Luxe Villa is perfectly situated for deluxe summer living. You can smell the salt water from the house and feel the Bondi atmosphere around you. Or we can offer you these as 12 separate beds as these King beds can be split into separate "King Single" beds if needed for a small fee. All beds have luxurious 5* hotel mattresses with extra support for a sound nights sleep. All bedding has natural fibre hotel quality linen. Beach-towels are provided. The house is perfect for wedding groups, corporates or extended families. There is a beautifully finished deluxe kitchen brimming with high-end Breville & Smeg appliances, and a wood dining table leading into an open & spacious open plan living room. Further opening up the sliding doors to the sun-filled wooden deck & open back garden. There is also a washing machine and dryer for laundering your clothes during your stay. The media/twin room and living room has 65' & 75' TVs with Foxtel cable tv, plus a Hard Drive full of movies connected to it. There is enough seating & chairs for your group to relax & enjoy our unique high-end Bondi villa. There is off-street parking for two cars with additional parking for a further two cars possible over the kerb. Ruby's Luxe is an exquisite house and was built with socializing and groups in mind. The vibe and location will leave you with lifetime memories, we look forward to welcoming you. NOTE: the villa has a strict NO PARTY policy, we do NOT accept Bucks or Bachelor parties at all, and no groups of under 30 year olds. Jonathan, Feb 2017 - Jet's place is truly amazing. We stayed there with a large group of people and the house was a perfect hub for us to explore Bondi. The house is modern and clean and is a fantastic location - the beach is a couple of minutes walk away. Our check in and check out were seamless. The staff looking after the venue were great and helped make our arrival and departure effortless. The air-conditioning was fantastic over a hot Sydney weekend when we weren't at the beach. We would absolutely recommend Jet's place. Jaye, December 2016 - Worth every penny. It was so amazing and better than the photos. 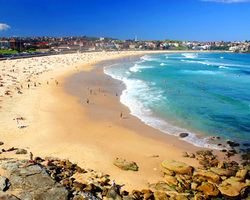 Bondi Beach is world famous and needs no introduction. It is fully patrolled by lifeguards just remember to swim in between the yellow & red flags. The north end of the beach is perfect for babies in the seawater pool. Additionally it's great for kids in the sea and the best for beginners to learn how to surf. The Sydney CBD is 20min by car. Bondi Junction Westfield is 10min by car. There is an awesome brand new shopping village less than 100m away that includes a "Harris Farm Markets" for amazing fresh groceries. Plus all trendy shops and the famous Bondi restaurants are all within 100m including "Hurricanes Grill" and the local trendy gem: "Mad Pizza"
Public transport is very easy. There are numerous bus stops around Bondi beach taking you to Watsons Bay, Bondi Junction, further south to Coogee or directly to the city. Trains taking you to all corners of Sydney run from Bondi Junction, so you will need to take a bus to connect to the train-line. There is also a taxi rank 50m from the front door. You could also walk around, with Rose Bay being 20mins away, Bondi Junction being 20mins also or Bronte beach a pleasant 25mins via the famous Bondi to Bronte walk. This beautiful beach is the closest to the Sydney city centre (8kms) and is home to the one of the world’s oldest surf life saving clubs, if not the oldest, 1km long, this beach can attract more than 40,000 visitors on a typical summer weekend. The surf can range from very large waves one day to calm and quiet the next. If the surf gets too large for your enjoyment, there are two pools at either end of the beach, at the southern end, the famous Bondi Icebergs and the northern end with the Kiddies Pool. At Bondi, you can find some great restaurants and nightlife. The dress is usually casual with t-shirts, sandals and shorts quite acceptable in most of the dining places, many with views. The Bondi Pavilion, on the beachfront, often has entertainment and exhibitions. There is a great coastal walk (6km) starting at the south end of the beach that takes in spectacular ocean views and allows you to visit a number of smaller but still scenic beaches all the way to Coogee. Or learn how to surf with lessons from a personal instructor. There is so much to do….. or just laze on the sand!